Countless contributions have dealt with the psychological, socio-cultural, cognitive, evolutionary aspects of creativity. The neuroanatomical and physiological aspects have been explored to a limited extent: which is odd, as creativity is the product of brain's activity. Elkhonon Goldberg's book has the brain as its undisputed main character; this makes it uniquely important. The role of the brain's physiology and anatomy in the generation of creativity, with thefrontal lobe and the prefrontal cortex in the privileged position, are discussed exhaustively and masterfully. Goldberg is a first rate neuroscientist and a born writer. In Creativity, Elkhonon Goldberg is subtle, judicious, relentlessly curious, fun and brutally honest about what neuroscience knows, and doesn't know, about the subject. He guides us through decades of research, to show that perhaps the most striking thing about our plastic organ of creativity, is that, while there are certain basic patterns in the creative brain, they are only starting points; the brainâs circuitry, being so plastic, likely has just asmany different ways of helping to produce creative states, as there are human ways of being creative. 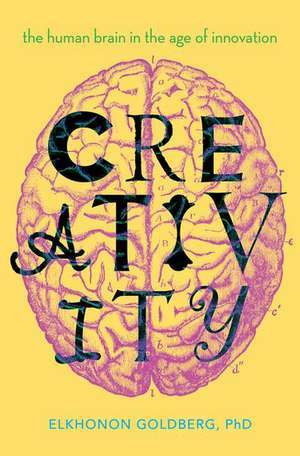 No one interested in the neuroscience of creativity can afford to miss this book. Dr. Goldberg has obviously travelled extensively and his observations and experiences seem like a beautifully written journey in themselves until he leads one to the point where he reveals even more involving aspects of creativity in other cultures and even species. As far as this book is concerned, Dr. Goldberg clearly knows what he's doing when it comes to Creativity. Elkhonon Goldberg's new book, Creativity: The Human Brain in the Age of Innovation is a very insightful study of our brains in a time of accelerating and multi-dimensional change. It is the fruit of both scholarly research and many decades of experience. Creativity is a wonderful addition to Dr. Goldberg's body of work. Elkhonon Goldberg, PhD, a leading-edge neuropsychologist and broad-ranging thinker, has provided a brilliant, synthetic account of human creativity. A sophisticated understanding of brain function is combined with insights from contemporary psychology, evolutionary biology, and cross-cultural studies to elucidate the key processes underlying innovation in the arts, sciences and all areas of human endeavor. Elkhonon Goldberg, PhD, ABPP, is a scientist, clinician, and educator. He is Director of Luria Neuroscience Institute and Clinical Professor in the Department of Neurology, NYU School of Medicine. Goldberg is internationally renowned for his research in cognitive neuroscience and clinical neuropsychology. He has authored several widely acclaimed books which have been translated into many languages. He lectures worldwide. Goldberg is also a clinicianwith an active practice in neuropsychology.